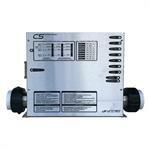 This United Spas command center works with the C5 Series with the B8 circuit board. United Spas Most Advanced Topside Yet! The T8-S topside measures in at approximately 6-3/8" x 3-3/8", and can be easily installed with a 2-1/4" hole saw. Installation requires three 2-1/4” holes to be cut out of the shell of the hot tub it is to be installed into. The three holes will need to be drilled in a straight line, with the center of each hole spaced 1-5/8” from the center of the previous hole. United Spas C5-B Digital Spa Control with Bottom Mount Heater. 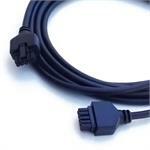 Includes T8-S topside w/adapter plate, main pump cord and light cord. FREE SHIPPING! Good replacement for Rec Warehouse, Leisure Bay, Balboa Value 2000LE,HydroQuip, Gecko,Premium Leisure.